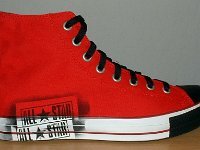 Photo gallery of stencil chucks, a fun seasonal model from 2005. 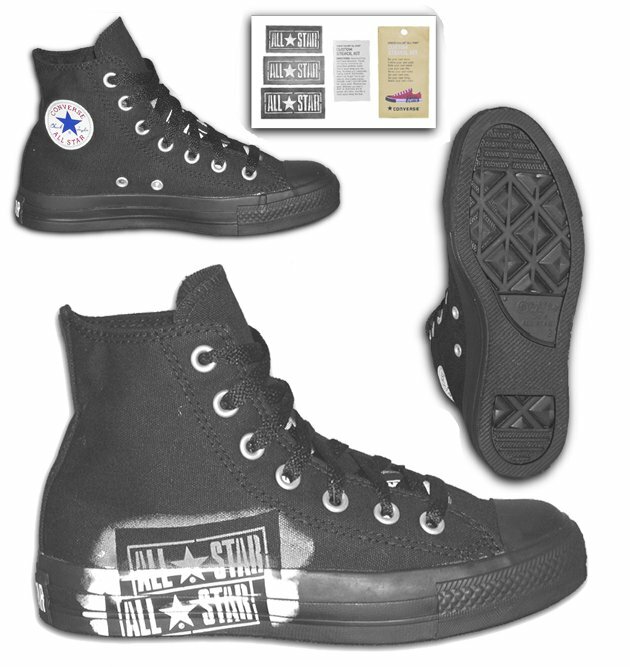 1 Stencil Chucks Catalog photo of black monochrome stencil high tops, showing right outside view, left inside patch view, left sole view, and the All Star stencil inserts, flyer, and envelope. 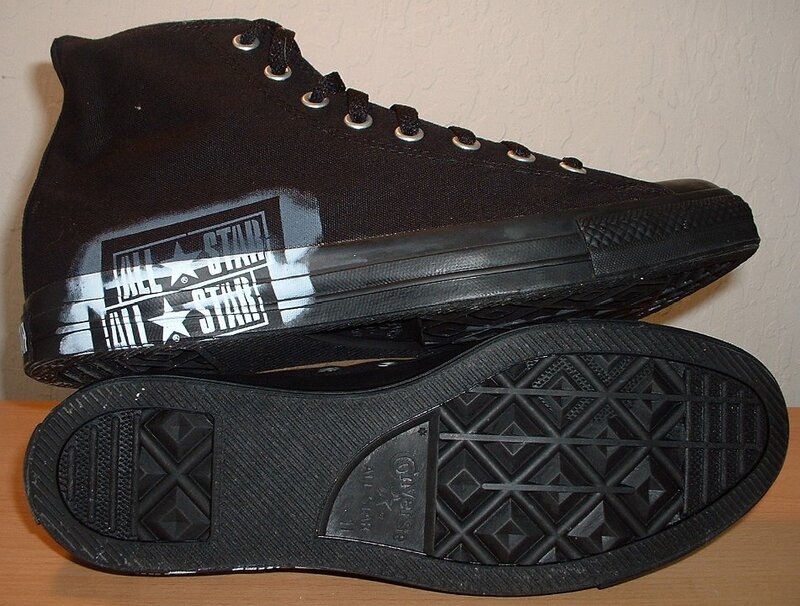 2 Stencil Chucks Outside view of a left monochrome black stencil high top. 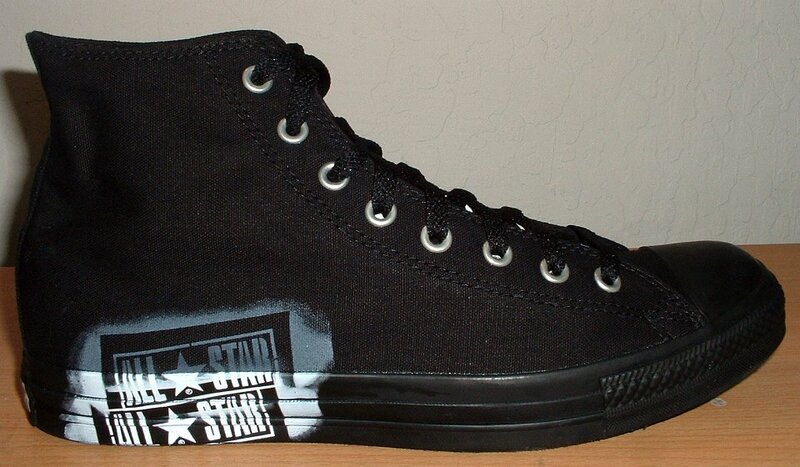 3 Stencil Chucks Inside patch view of a left monochrome black stencil high top. 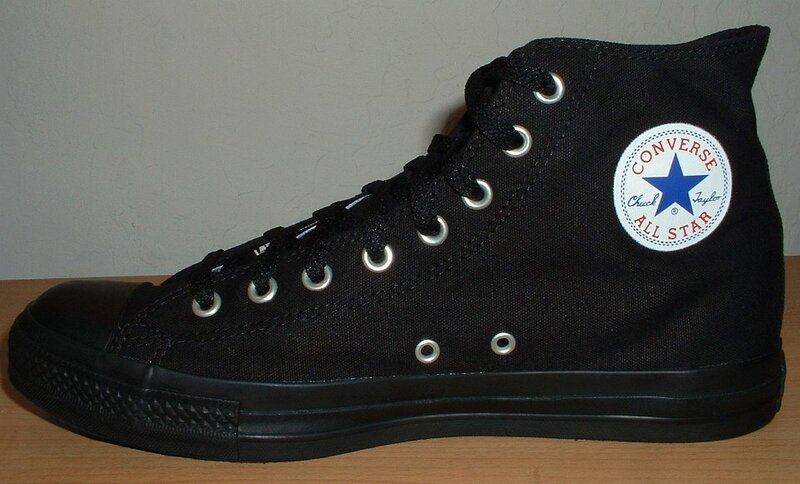 4 Stencil Chucks Inside patch view of a right monochrome black stencil high top. 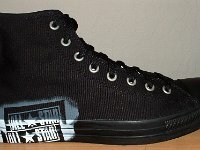 5 Stencil Chucks Outside view of a right monochrome black stencil high top. 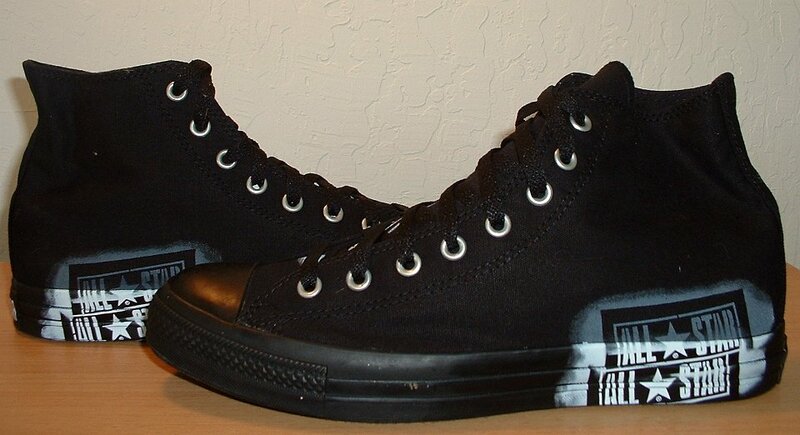 6 Stencil Chucks Rear view of monochrome black stencil high tops. 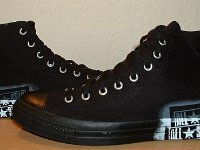 7 Stencil Chucks Front view of monochrome black stencil high tops. 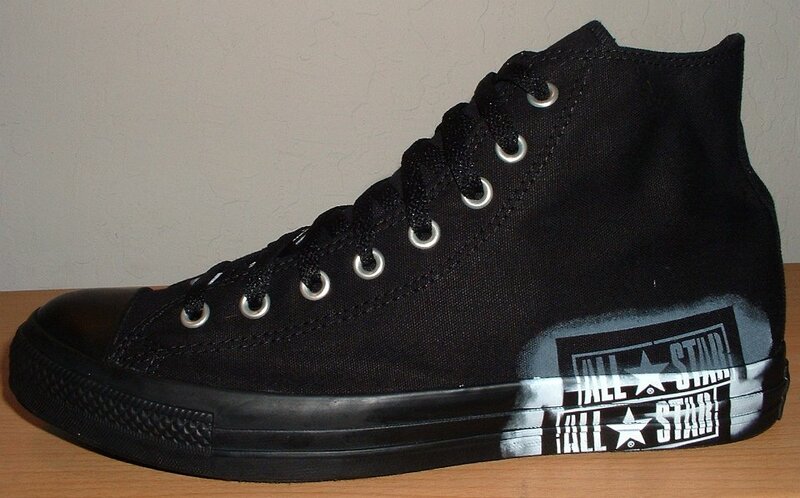 8 Stencil Chucks Outside and sole views of monochrome black stencil high tops. 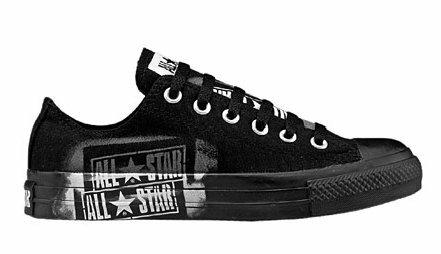 9 Stencil Chucks Inside patch views of monochrome black stencil high tops. 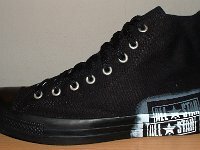 10 Stencil Chucks Outside views of monochrome black stencil high tops. 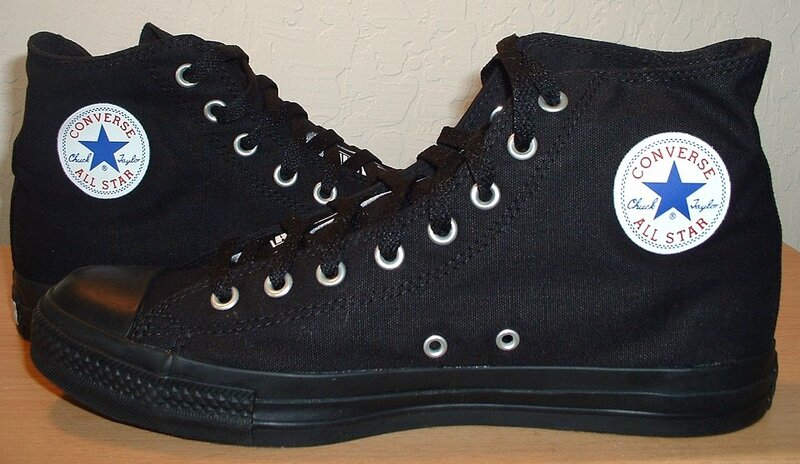 11 Stencil Chucks Angled front view of monochrome black stencil high tops. 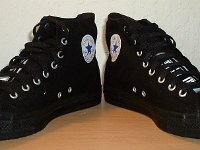 12 Stencil Chucks Top view of monochrome black stencil high tops. 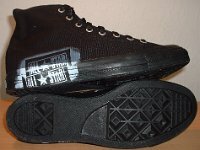 13 Stencil Chucks Side view of a right monochrome black stencil low cut. 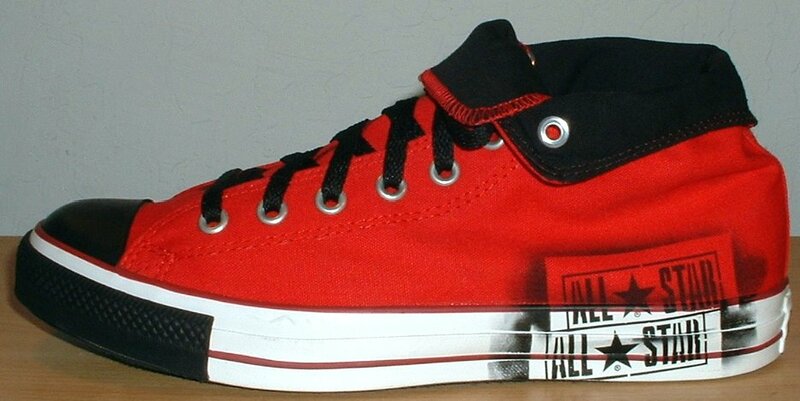 14 Stencil Chucks Catalog photo of red monochrome stencil high tops with black toe caps and guards, showing right outside view, left inside patch view, left sole view, and the All Star stencil inserts, flyer, and envelope. 15 Stencil Chucks Catalog view of pink low cut stencil chucks, showing the right outside view, left sole view, and stencils, insert, and envelope. 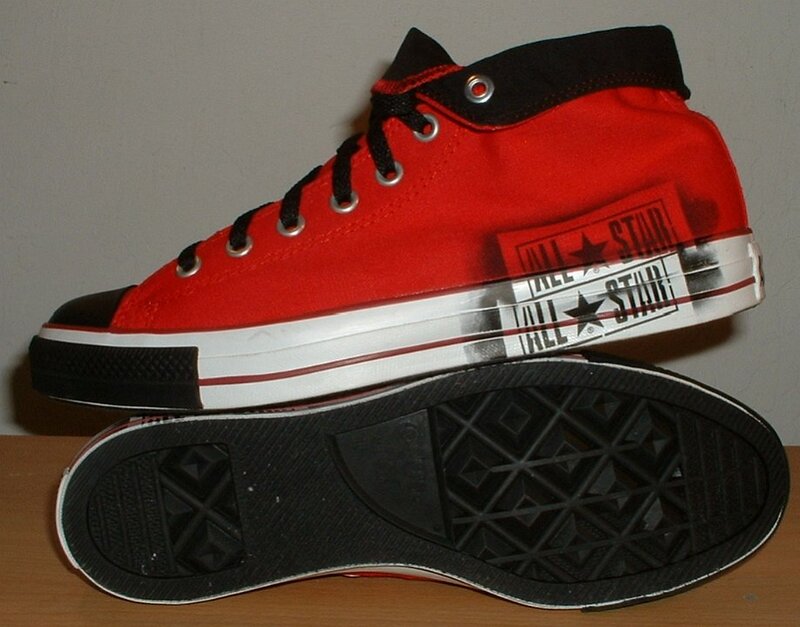 16 Stencil Chucks Inside patch view of a left red stencil high top with black toe cap, toe guard, and laces. 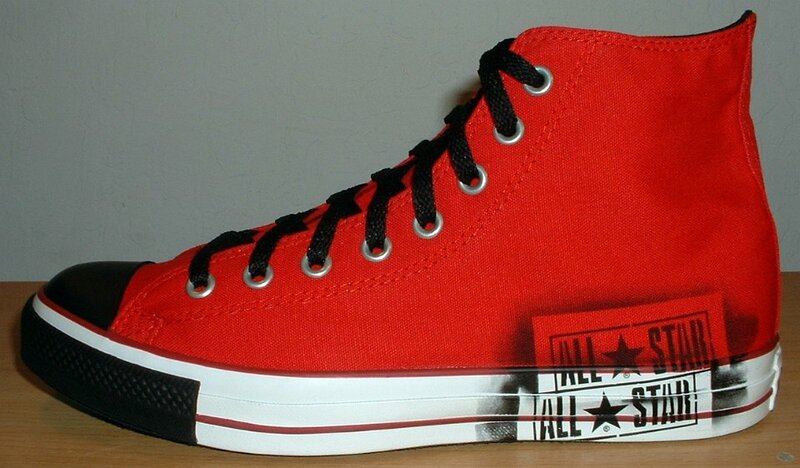 17 Stencil Chucks Outside view of a left red stencil high top with black toe cap, toe guard, and laces. 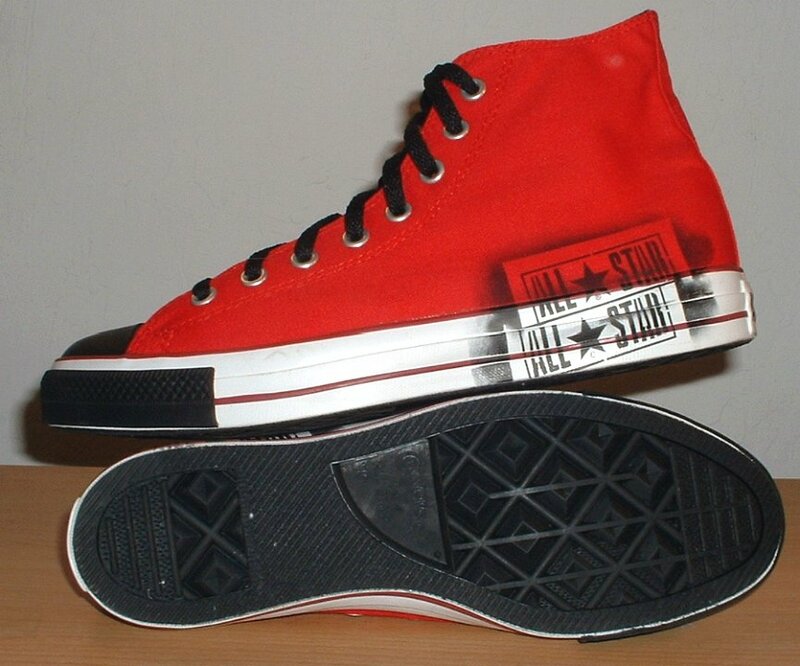 18 Stencil Chucks Inside patch view of a right red stencil high top with black toe cap, toe guard, and laces. 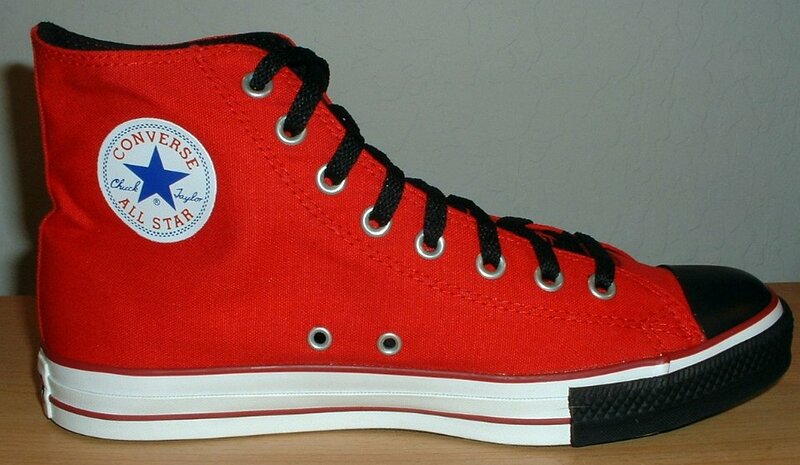 19 Stencil Chucks Outside view of a right red stencil high top with black toe cap, toe guard, and laces. 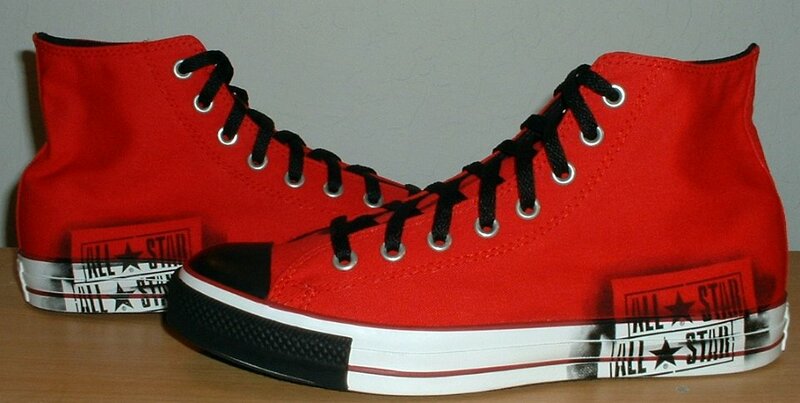 20 Stencil Chucks Front view of red stencil high tops with black toe caps, toe guards, and laces. 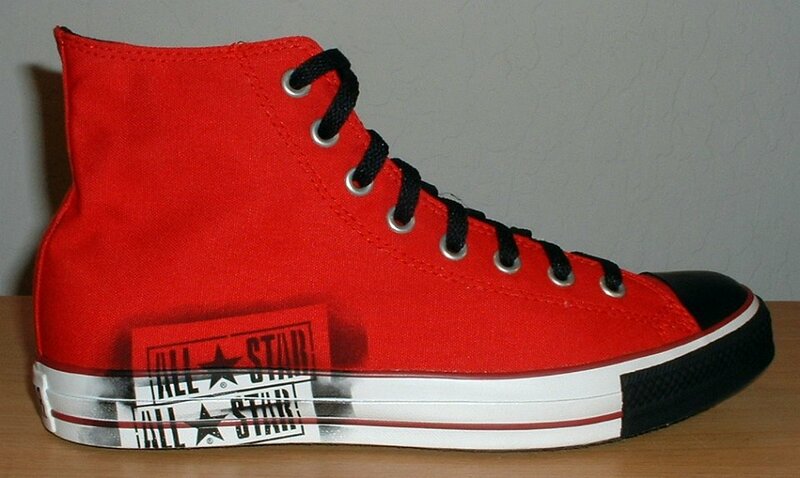 21 Stencil Chucks Rear view of red stencil high tops. 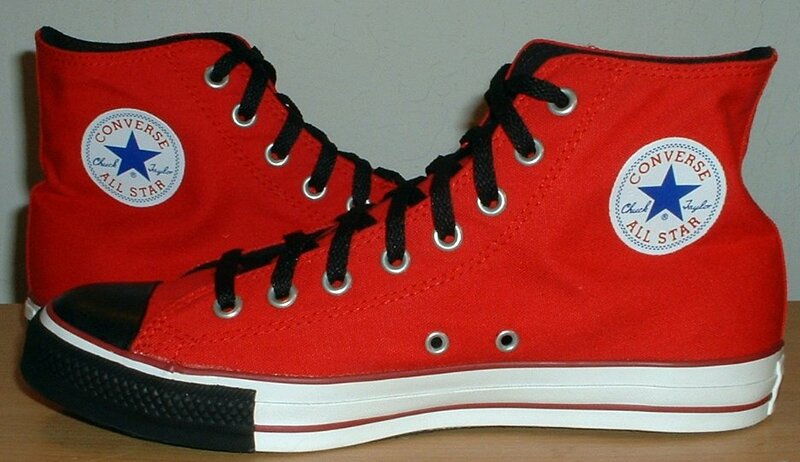 22 Stencil Chucks Angled front view of red stencil high tops with black toe caps, toe guards, and laces. 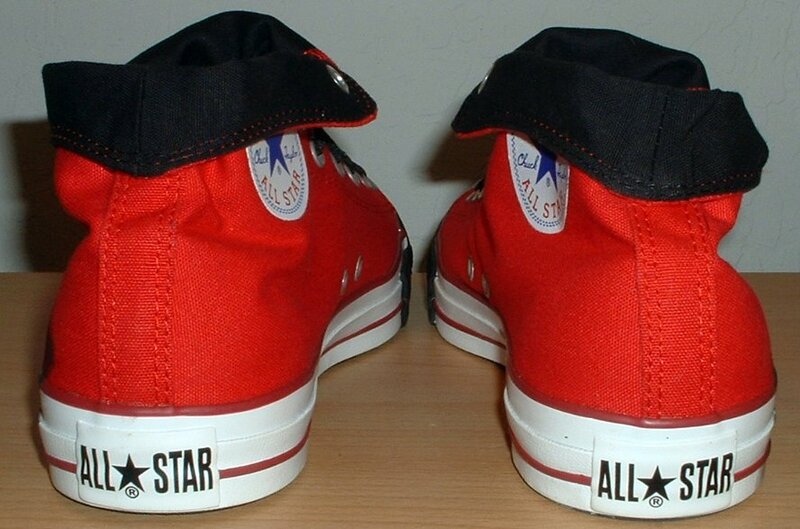 24 Stencil Chucks Top view of red stencil high tops with black toe caps, toe guards, and laces. 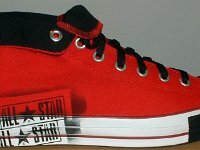 25 Stencil Chucks Inside patch views of red stencil high tops with black toe caps, toe guards, and laces. 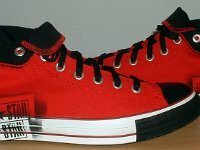 26 Stencil Chucks Outside views of red stencil high tops with black toe caps, toe guards, and laces. 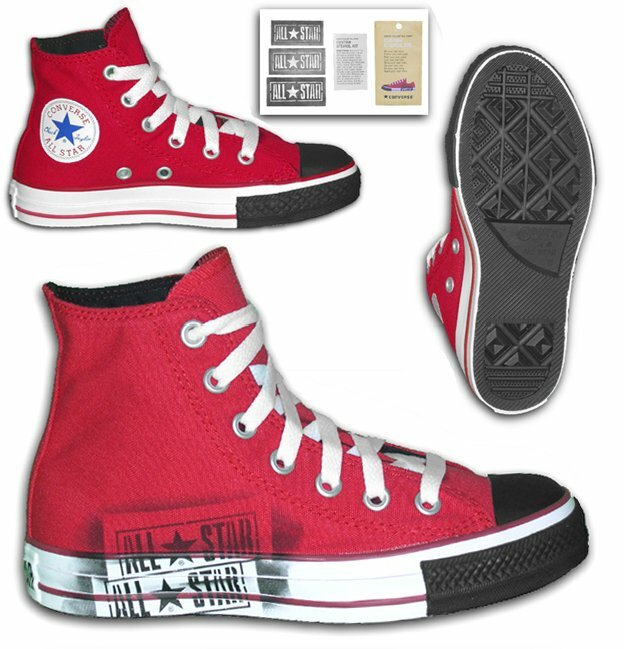 27 Stencil Chucks Inside patch and sole views of red stencil high tops with black toe caps, toe guards, and laces. 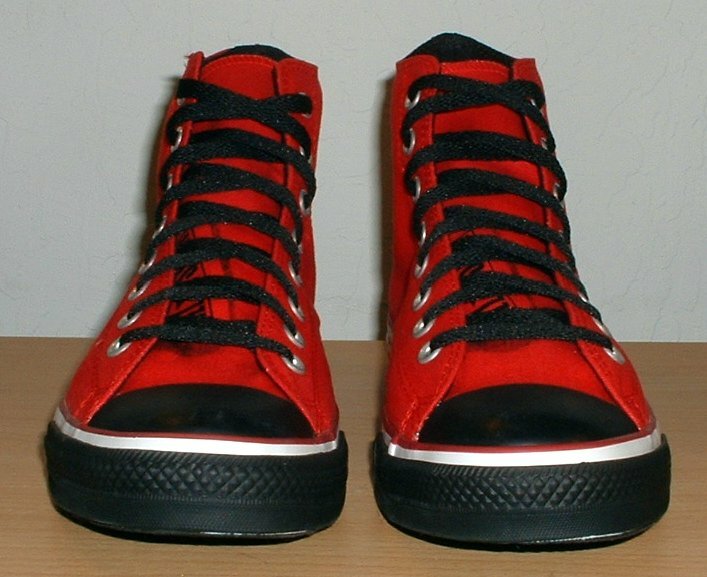 28 Stencil Chucks Front view of red stencil high tops with black toe caps, toe guards, and laces. 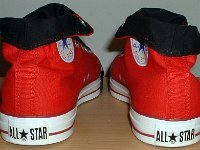 29 Stencil Chucks Inside patch view of a rolled down left red stencil high top with black toe cap, toe guard, and laces. 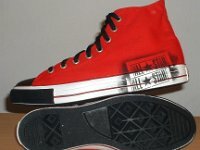 30 Stencil Chucks Outside view of a rolled down left red stencil high top with black toe cap, toe guard, and laces. 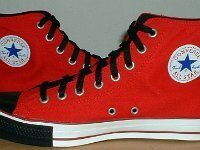 31 Stencil Chucks Outside view of a rolled down right red stencil high top with black toe cap, toe guard, and laces. 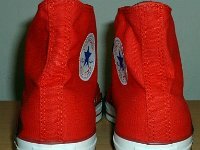 32 Stencil Chucks Inside patch view of a rolled down right red stencil high top with black toe cap, toe guard, and laces. 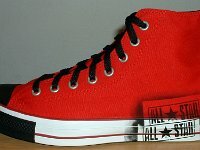 33 Stencil Chucks Rear view of rolled down red stencil high tops. 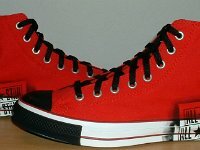 34 Stencil Chucks Front view of rolled down red stencil high tops with black toe caps, toe guards, and laces. 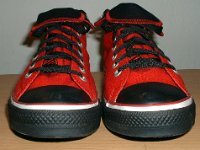 35 Stencil Chucks Top view of rolled down red stencil high tops with black toe caps, toe guards, and laces. 36 Stencil Chucks Inside patch view of rolled down red stencil high tops with black toe caps, toe guards, and laces. 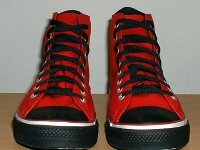 37 Stencil Chucks Outside view of rolled down red stencil high tops with black toe caps, toe guards, and laces. 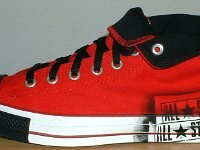 38 Stencil Chucks Outside and sole views of rolled down red stencil high tops with black toe caps, toe guards, and laces. 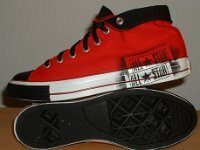 39 Stencil Chucks Inside patch and sole views of rolled down red stencil high tops with black toe caps, toe guards, and laces. 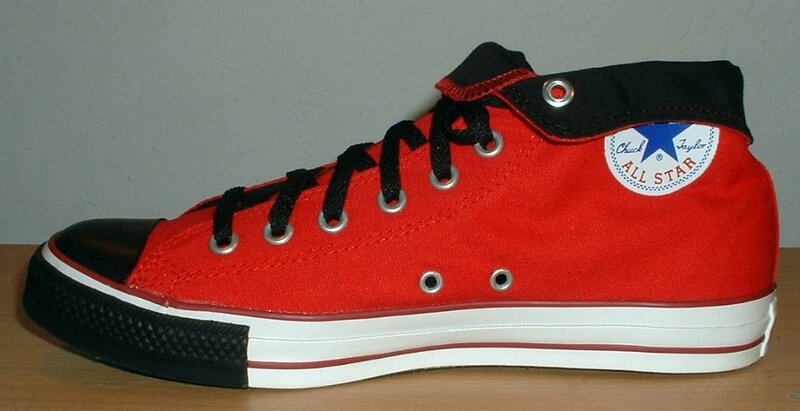 40 Stencil Chucks Outside view of a right red stencil low cut with black toe cap, toe guard, and whites laces. 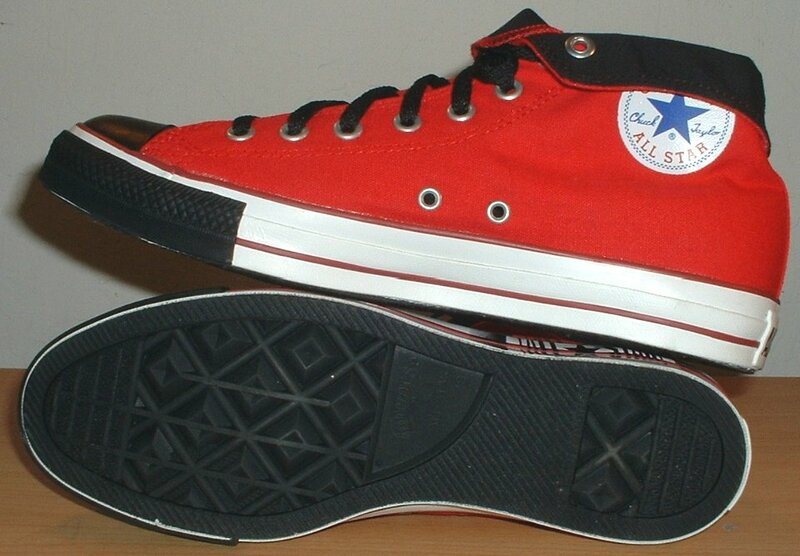 41 Stencil Chucks Sole view of a right red stencil low cut. 42 Stencil Chucks Outside side of a right white stencil high top. 43 Stencil Chucks Sole view of a left white stencil high top. 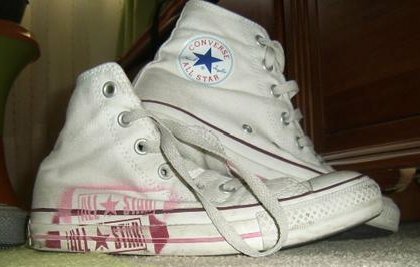 44 Stencil Chucks Side view of worn white stencil high top chucks. 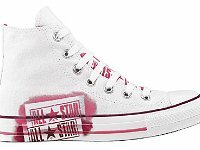 45 Stencil Chucks Side view of worn white stencil high top chucks. 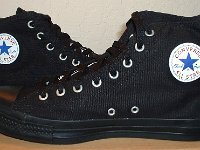 Stencil chucks were introduced in 2005. 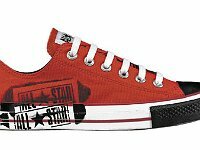 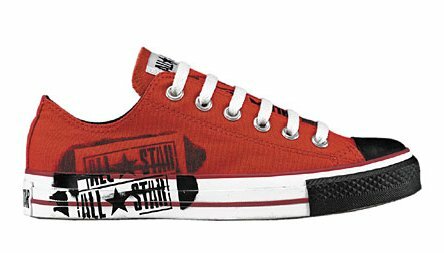 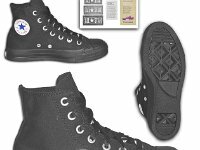 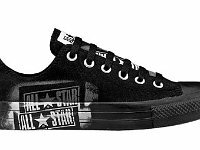 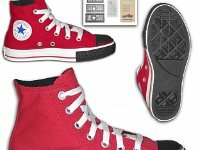 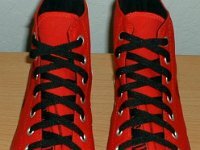 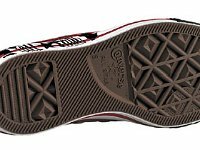 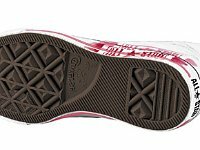 They are meant to be a fun kind of action shoe complete with a stencil kit that you can use to customize the shoes or paint the All Star license plate logo on other things. 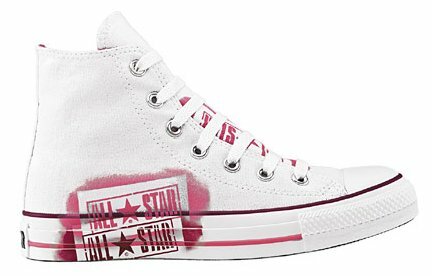 Instead of the Chuck Taylor key chain tag, each pair comes with a custom stencil kit in an envelope and Converse "spray paint" tag that says "Consider yourself tagged". 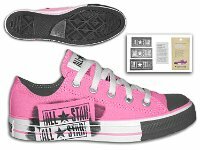 The kit contains three small stencils along with some humorous directions. 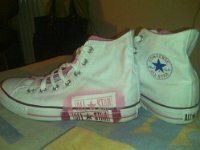 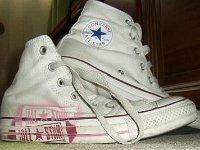 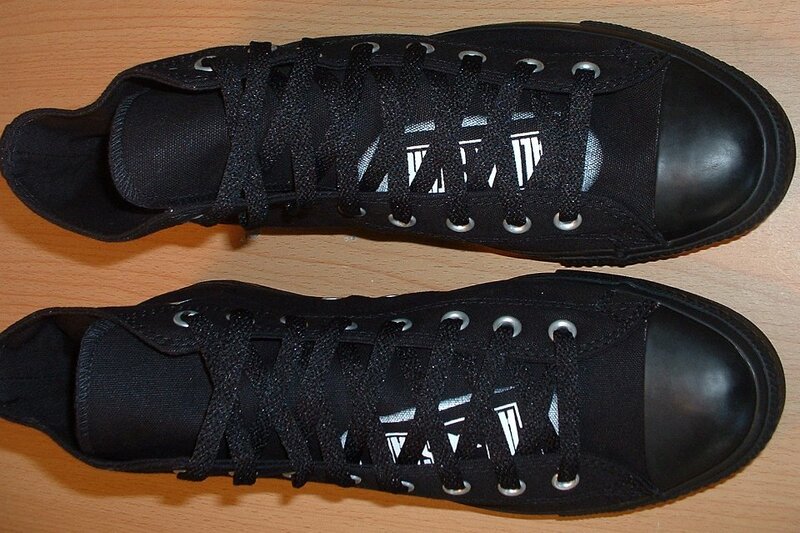 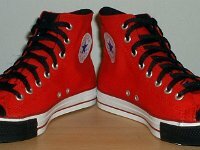 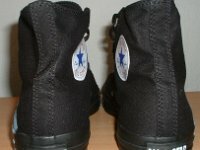 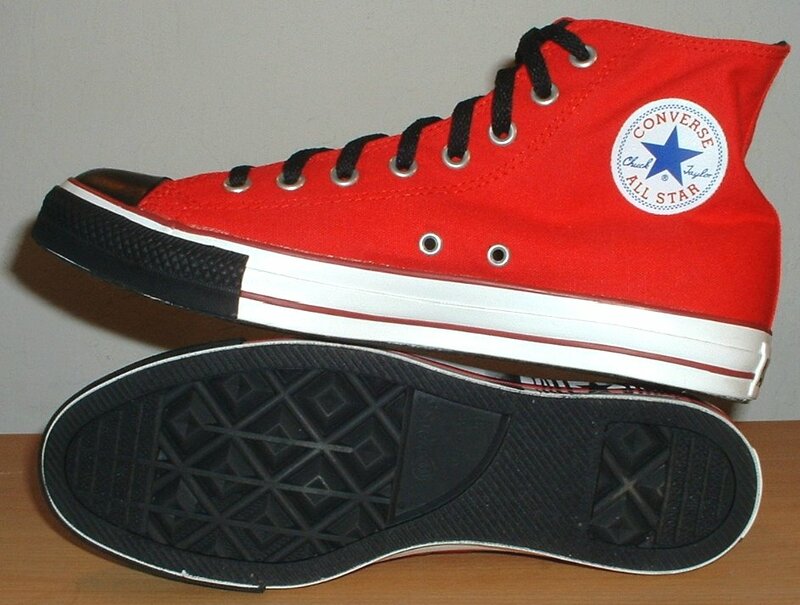 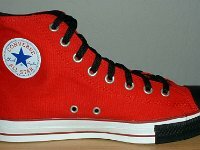 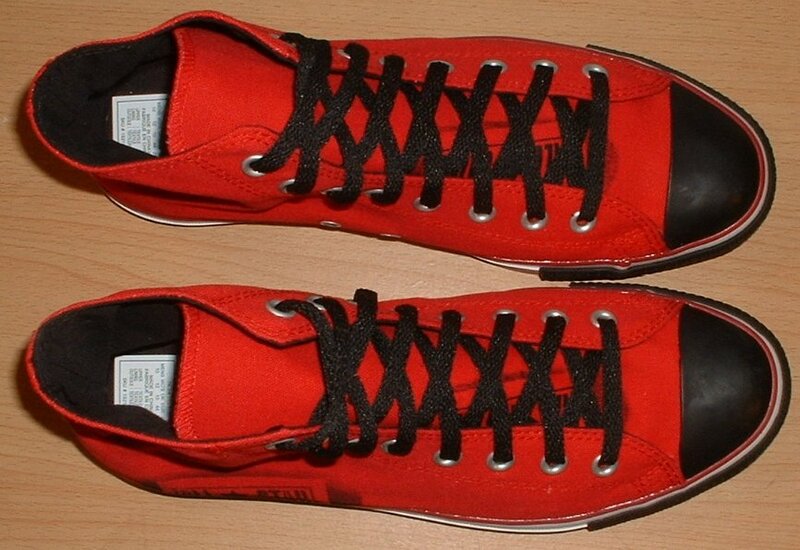 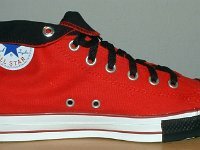 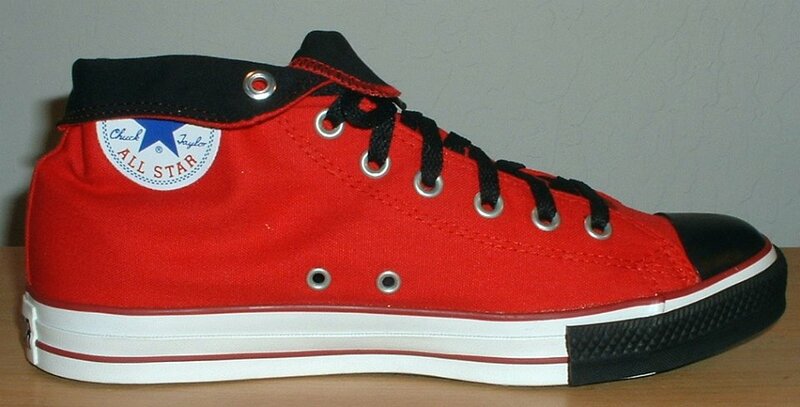 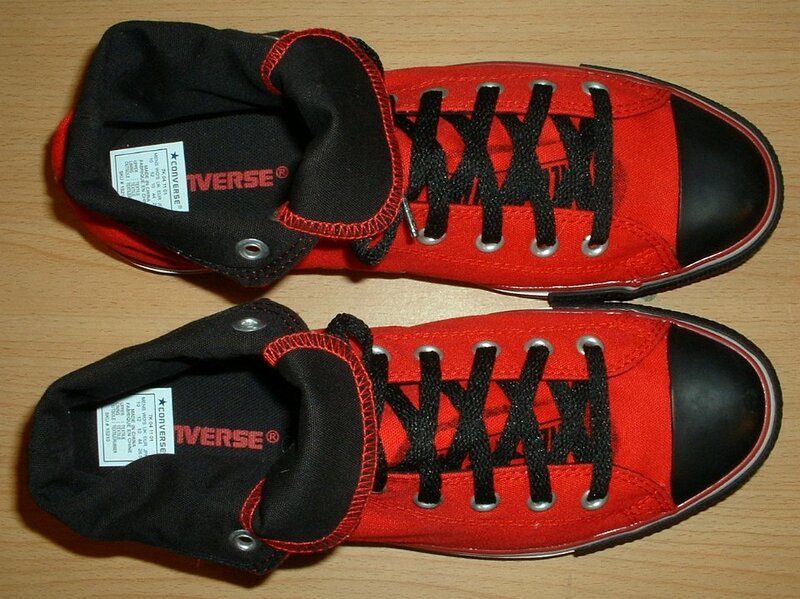 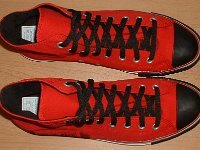 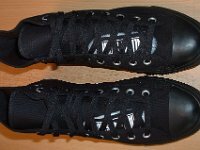 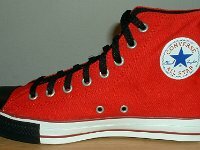 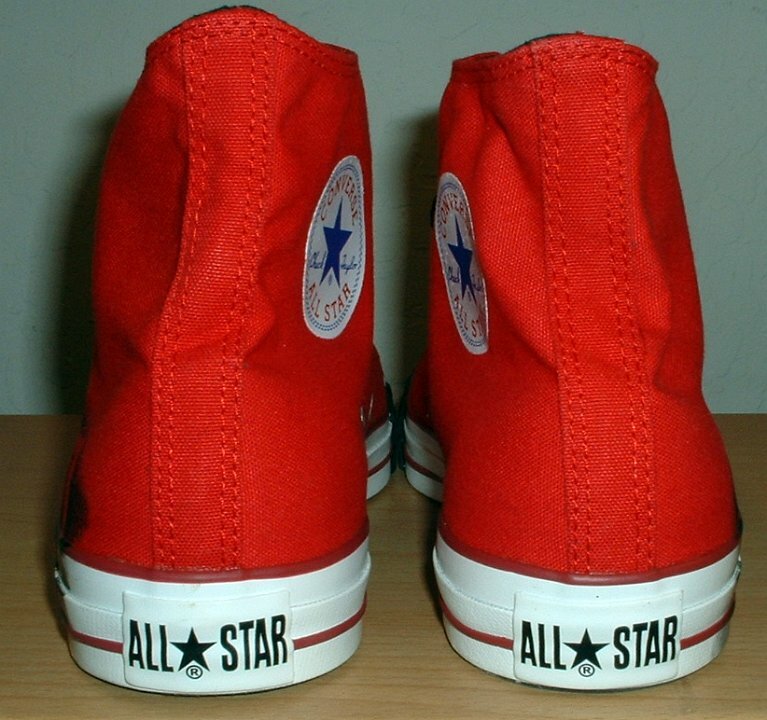 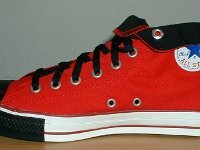 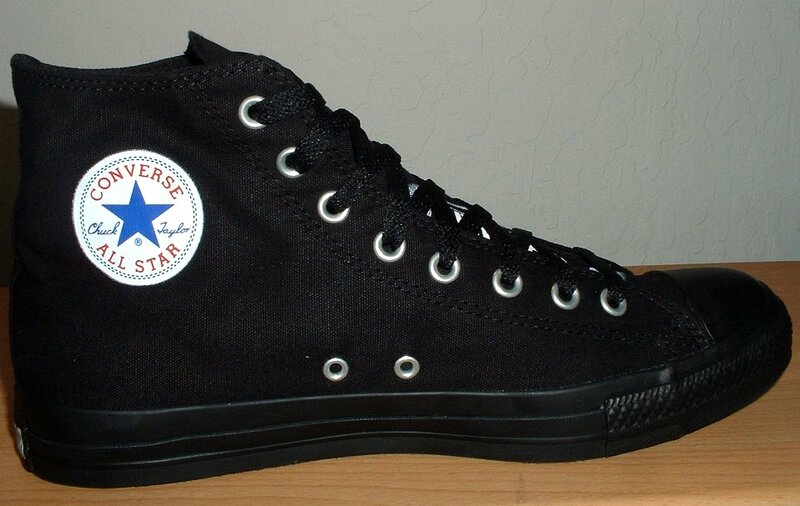 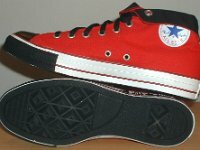 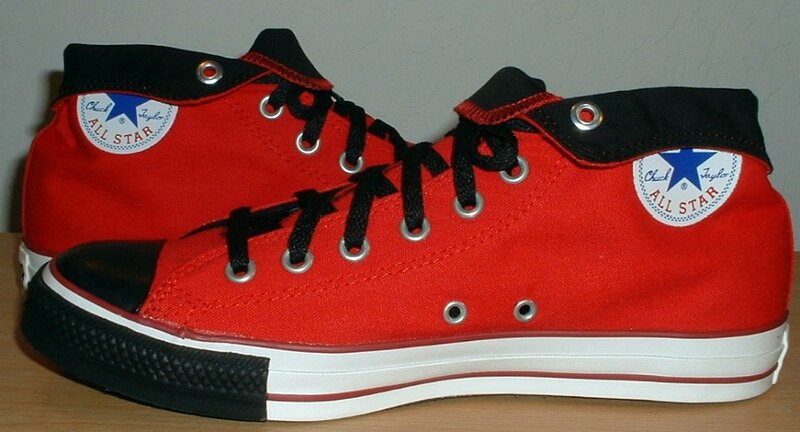 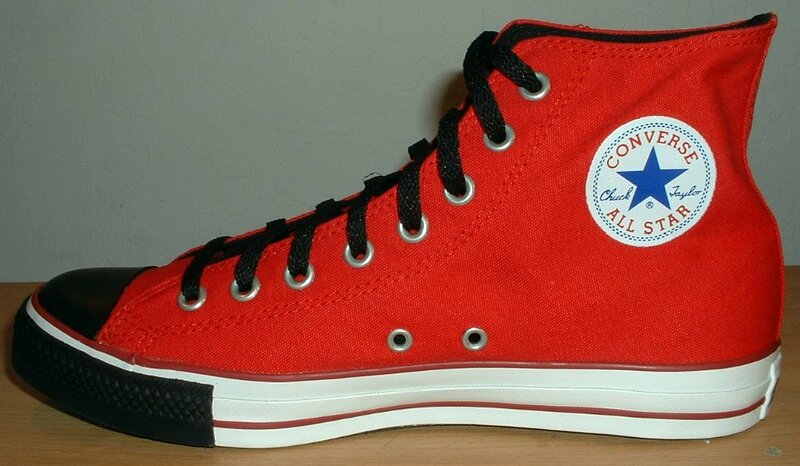 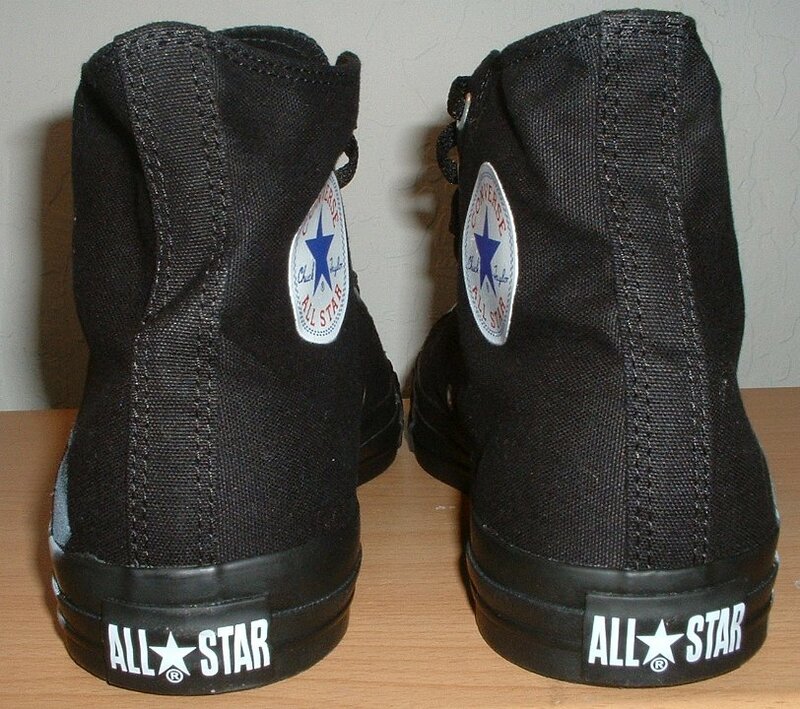 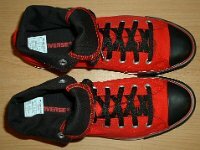 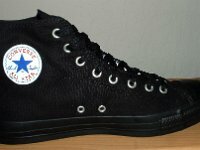 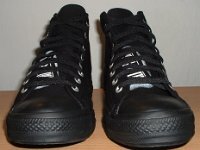 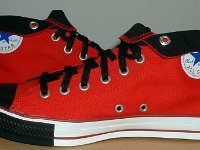 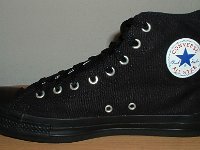 Stencil chucks were issued in black monochrome, white, and red high top models, and black monochrome and pink low cut models. 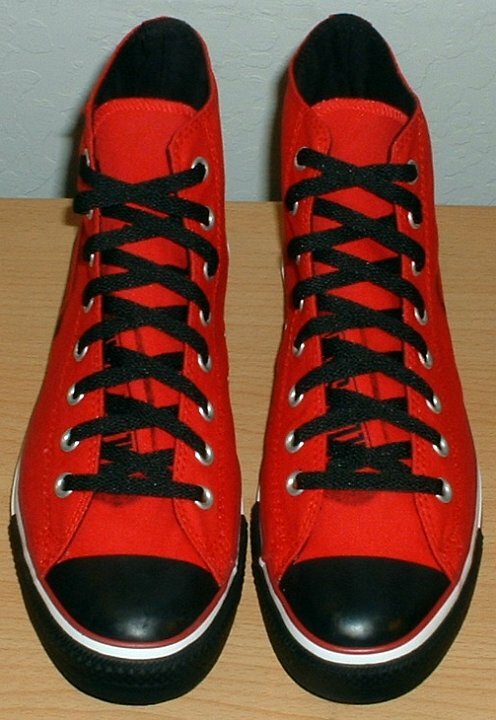 The red and pink models have black toe caps and toe guards.